It didn’t actually start off with this theme! We had a seaside idea in mind, but I got over excited in Ikea after spotting the bed canopy and everything else seemed to fall in place! You may recognise the awesome metal suitcase shelves that we used to have in the bathroom of our previous house. They are perfect in Betsy’s room and are now adorned with vintage Ladybird books and toys! The bedding set is from Asda Living and came with a quilt, bumper and a couple of sheets. I adore the retro lion and tiger cushions, mini suitcases and melamine plates! They are from Dotcomgiftshop and tie everything in together! The elephant cushion was a recent buy from Sass & Belle. It is so funny and they do a zebra wearing a cowboy hat too! After scouring the internet for a hot air balloon light, I decided to make my own. The ones I found were either too expensive or had teddy bears, bows and pearls everywhere. I am so pleased with how it turned out that I am now taking commissions! I even made little peg people of Richard, Betsy and I! If you would like one with your choice of theme (Imagine a steampunk version! ), then message me for details. So here it is, I hope you like it! Her room is very small, but I tried to fill it with lots of cheery things and sensory objects! Posted in Arts and Crafts, Day to Day, Home and Leisure and tagged baby bedroom, circus bedroom, circus themed bedroom, dotcomgiftshop, hot air balloon lamp, hot air balloon light, kids bedroom, kids circus bedroom, kitten von mew, vintage baby bedroom, vintage bedroom, vintage kids bedroom. Bookmark the permalink. Yesterday I ventured to the NEC’s MCM Comicon Expo! I used to go to the Film Memorabilia Show all the time and really loved to see all the original movie props, tons of movie celebs and browse the stalls. I must admit that if it hadn’t been for Warwick Davis, people watching and the illustrators and artists, I would have left early. It is definitely not what I had hoped for, more of a large market place with a handful of celebrity signings, but the atmosphere is good and the people dressed up really do make an effort. It is now a mixture of movie, anime and gaming, so that my area (movie) is much more diluted. I think I will have a scout around at some other movie memorabilia shows to attend at another point, maybe some that are purely horror or Sci Fi maybe. That said, we had a lovely time and hooked up with Mr Burt for a browse of the stalls! I got to meet one of my all time favourite actors Warwick Davis, who made my day! Not only did he get his son to take a picture of us together on his phone, but then in his live Q&A said that the best thing he had seen was the girl in the Leia costume riding an Ewok! Huzzah! 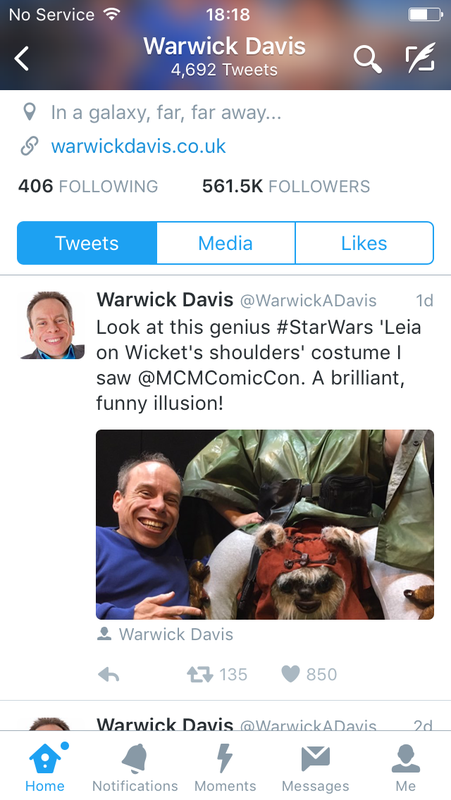 Warwick also said that I should enter the costume competition at the Star Wars Celebration in London. Would have loved to do this, but just don’t have the funds to go unfortunately! So anyway, here are some photos of our day. I made Mr Mew’s Mugatu top and Betsy is supposed to be his pet poodle. I did make her an Ewok outfit, but she just wouldn’t keep the hood on and it way way too hot to wear anyway! Posted in Day to Day and tagged birmingham comicon, comicon, funny star wars costume, kitten von mew, leia ewok costume, leia on an ewok, leia on wickets shoulders costume, leia riding ewok, mcm comicon, mugatu costume, richard von mew, star wars costume, warwick davis, warwick davis comicon, wicket. Bookmark the permalink.